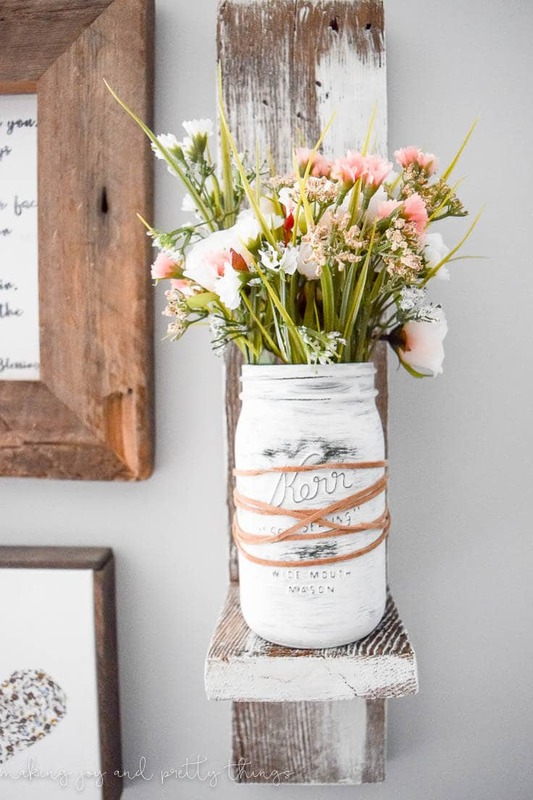 Freshen up your home for spring with an easy farmhouse style spring mason jar planter. 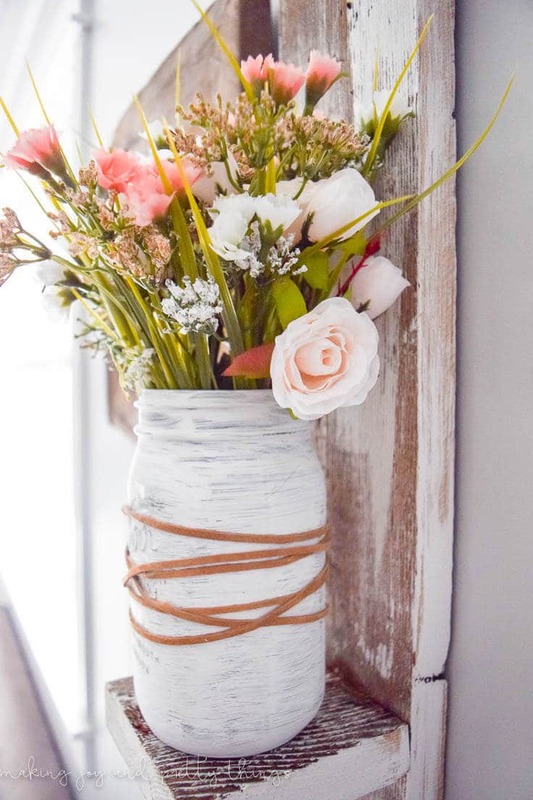 I’m so happy to be back from Making Joy and Pretty Things to share a crazy easy flower arrangement to get you ready for SPRING! Doesn’t it feel SO good to even say “spring”? Living in the Northeast, this is about the time of the year where I’m sick of cold and snow and gray skies. And, to make matters worse, we had an unseasonably warm week in February with temps in the 60s, blue skies and sunshine. I took the kiddos outside every day and they ran and played in the mud. It was an amazing week but yet a horrible tease as the very next day it snowed. There’s something almost magical about the end of winter and beginning of spring. Don’t get me wrong, I enjoy experiencing all 4 seasons. I even like the snow! But, there’s nothing better than feeling the sun’s warmth on your skin. Or, seeing the trees sprout their tiny green buds. Or, my personal favorite, heading to the nursery to pick out all the pretty flowers we will plant every year. 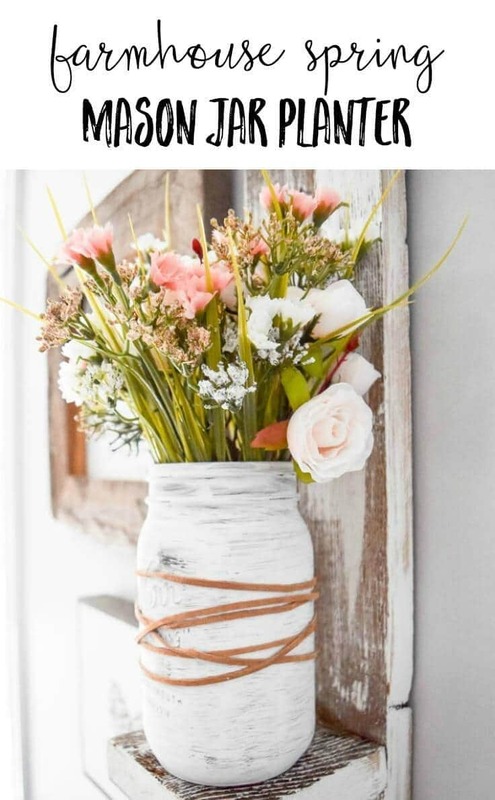 Since it’s a bit too early to plant any real flowers, I decided to make an easy farmhouse style spring mason jar planter. I personally can’t wait to add all the pops of spring colors into my decor. And, this little planter seemed like the perfect place to start and the sweetest reminder that spring is just right around the corner. 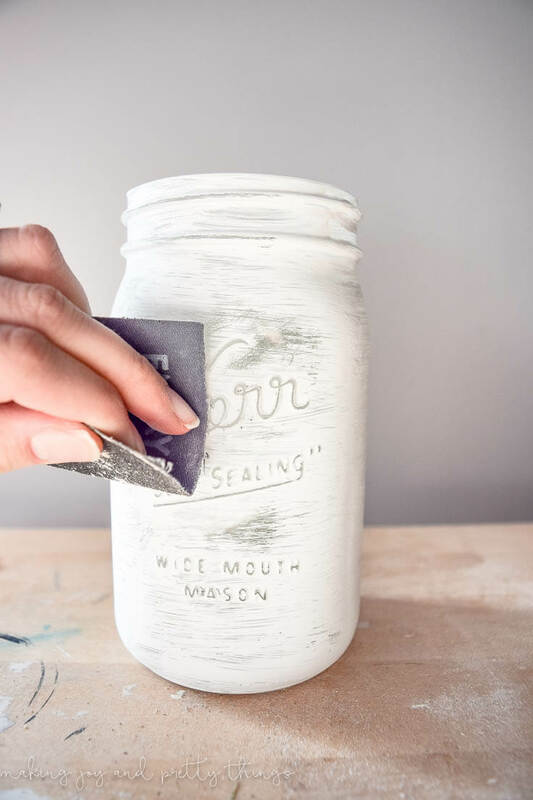 I started by painting a large mason jar with my favorite paint – Rust-Oleum Chalked Paint in Linen White. 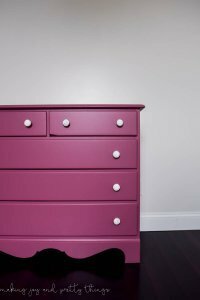 This paint is my go-to paint for any farmhouse or rustic project. I’ve had the same quart for well over a year, so a little goes a long way. 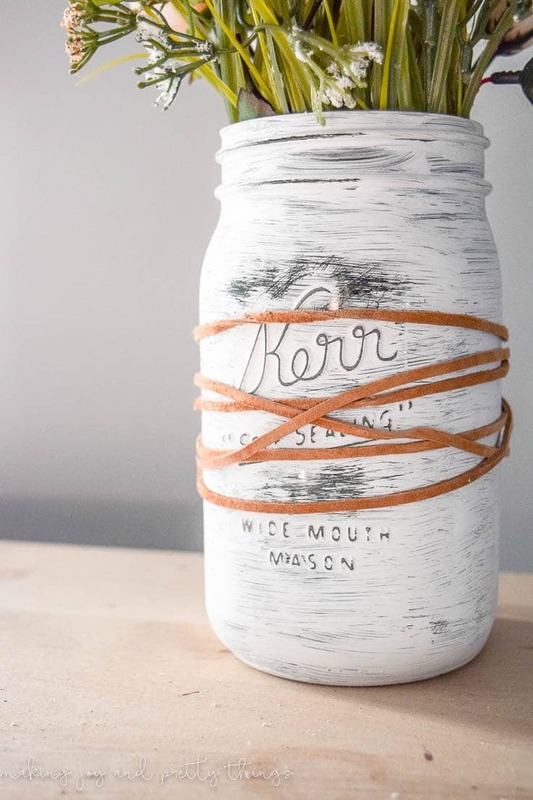 I used a foam brush to paint the mason jar because that gives you a cleaner, less “streaky” look. But, a regular ole’ brush would do just fine, too. Once the paint was dry, I used some sandpaper I had on hand to give it a distressed look. I used extra coarse sandpaper, but, that’s only because that’s all I could find. Any type would work. 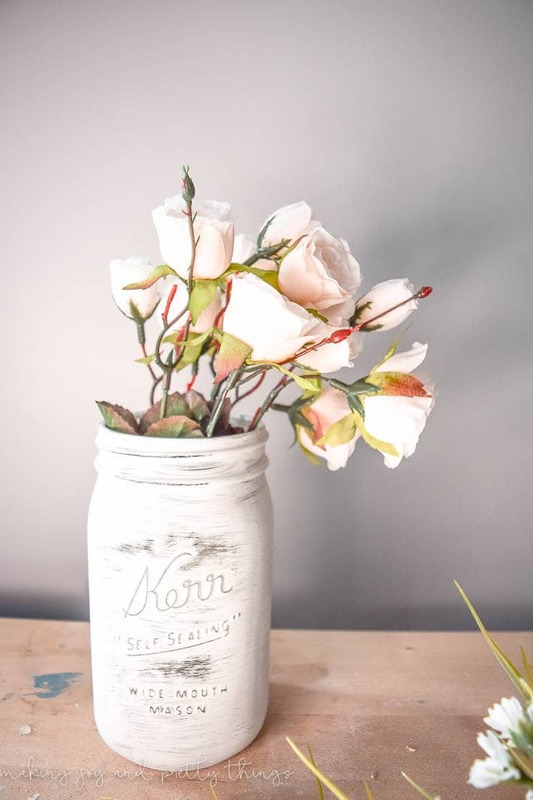 If you would like your mason jars to house fresh cut flowers, you may want to try this easy waterproofing method to paint your jars. 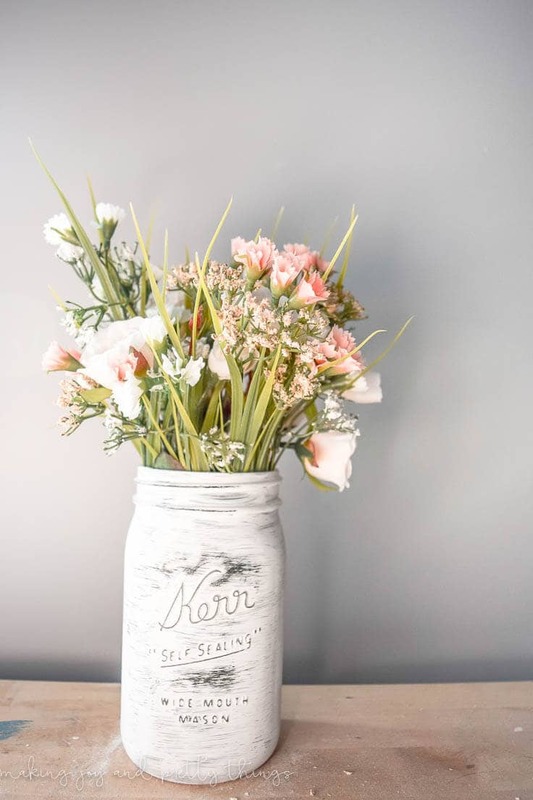 With the mason jar painted and distressed, it was time to pick the flowers! Now, I am no flower arranging wizard. I see all these amazing arrangements on Pinterest and my mind just can’t even imagine how to make it. Luckily, Michaels sells bundles or bushes of pretty flowers with some greenery mixed in. 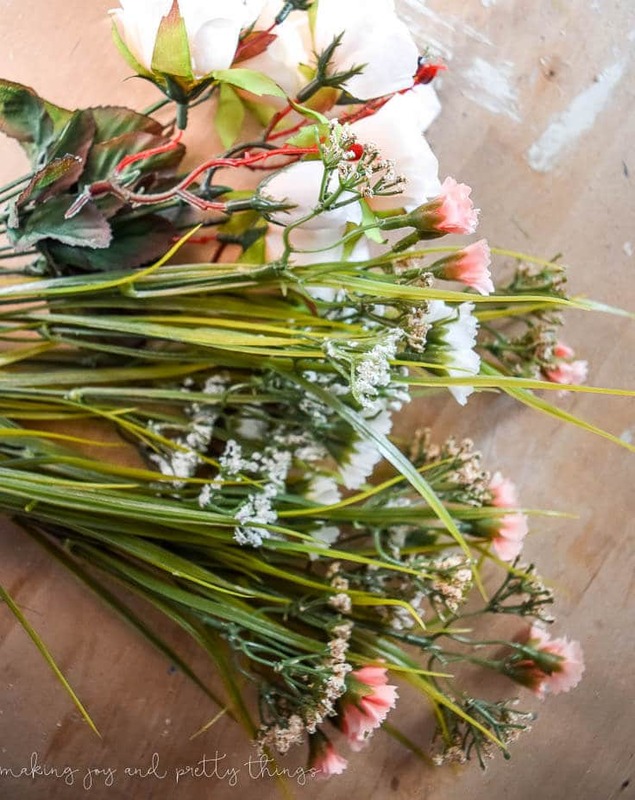 It takes the guesswork out of flower arranging. Also, be on the lookout for sales on Michaels. When I snagged these flowers, they were 40% off plus I had a 20% off total purchase including sale items. 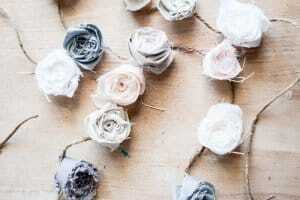 Never buy faux florals at full price! Here was what I came home with: pale pink roses and two bushes of flowers from their spring section (one in white and one in pale pink). Unfortunately, these aren’t sold online so I can’t link to an exact product. 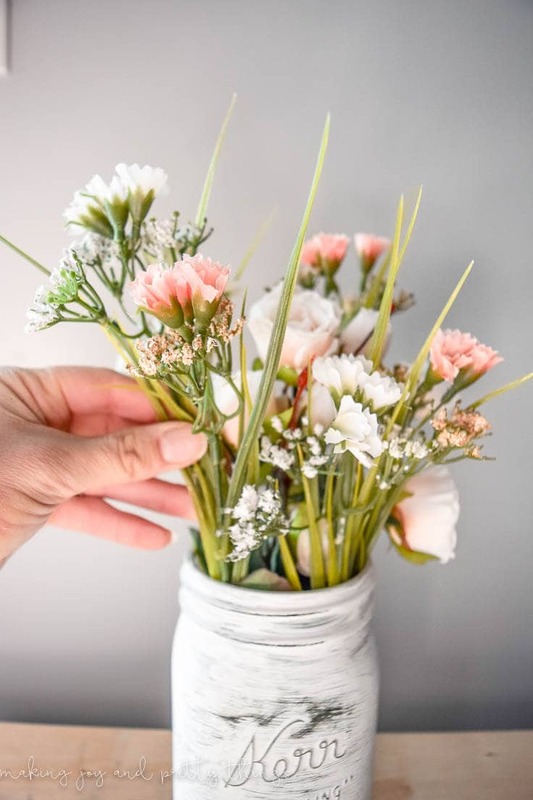 But, browse Michaels spring florals and they’re sure to be there (or you’ll be inspired by something completely different!). I added the roses in first because I want them to be in the center. Next, I cut off about 1/3 of each of the white and pink florals from their respective bushes. Then, I slowly placed these around and in between the roses until I got a mixed look. I wanted it to look like I went into a field of beautiful flowers and grabbed a handful. But, it was missing something. I had some random suede lace on hand (why, I don’t know) that I decided would add the perfect touch. I tied it off in the back, wrapped it around in no particular way or order, then tied it off in the back again. I added them the mason jar planter to a reclaimed wood wall shelf I made last year. This mini gallery wall sits in our living room. It’s the perfect place for a little spring touch. 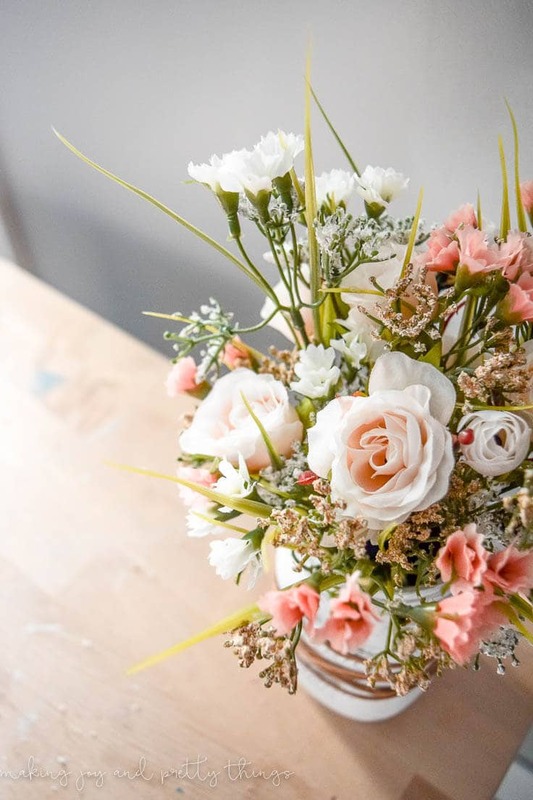 I love looking over and seeing the pale pink flowers – the best reminder of spring months to come. Sarah, this is a great idea! 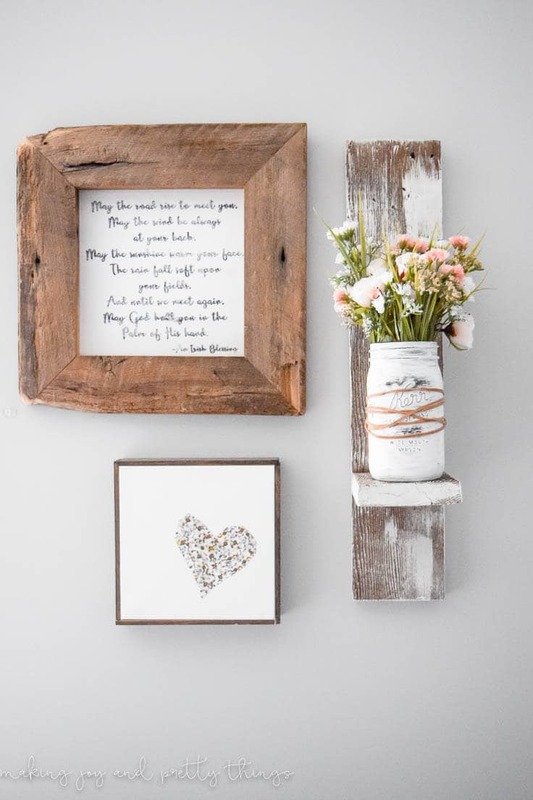 And it adds a perfect touch of farmhouse charm, not to mention some Spring cheer! Isn’t it gorgeous, Pam?! So simple and yet so beautiful! This is so pretty Sarah!! 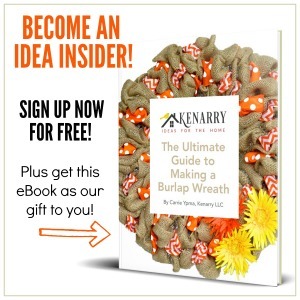 I love the added touch with the wrap around suede leather – it needed it. 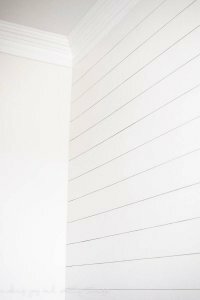 I also love that it is simple yet so so Springy, looks great on the gallery wall. 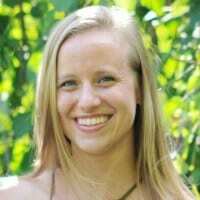 Sarah did a wonderful job! Thanks for noticing, Zan. I wholeheartedly agree — that suede leather really makes it. Sarah — the leather cord wrapped around it is a great detail. It really makes it custom.